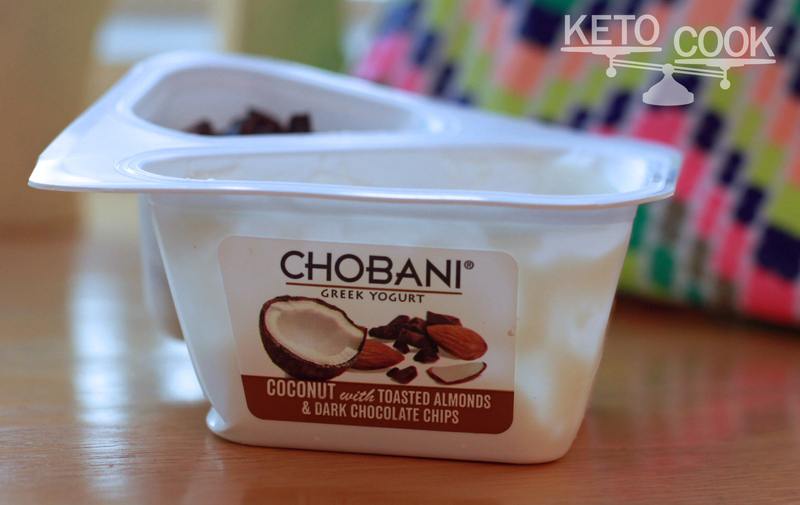 I saw these Chobani yogurts and immediately thought they would be great to re-create as a fun keto meal! I re-used the original container (after washing of course) and covered the top with Press ‘n Seal. I packed it for Charlotte’s lunch and she was thrilled! I used pecans instead of almonds because they are slightly higher in fat. Macadamia nuts would also be a good option to increase fat. If you need a higher ratio meal, consider using full fat greek yogurt. Fage and Trader Joe’s both make higher fat yogurt than the 2% I used. And yes, I put Fage Yogurt in a Chobani container… do not get confused and think I used the yogurt that comes in the Chobani package! Sorry for the messy picture, I was in a huge rush to get the kids off to school! 1. If you are re-using containers, make sure you wash them very well. 2. Mix the yogurt, coconut oil, safflower oil and liquid stevia together very well. The coconut oil will quickly harden once mixed with the yogurt. Stir quickly to avoid limps of solid coconut oil. 3. Combine the coconut, pecans and dark chocolate in the smaller container. 4. Top the coconut flavored yogurt with the dry ingredients just before eating. 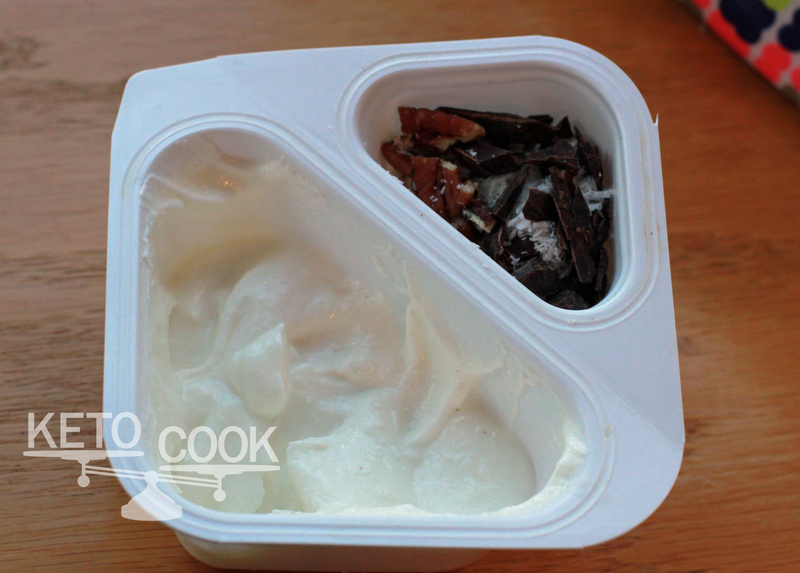 If you are packing this for luck, make sure you use an ice pack to keep the oil from spearing from the yogurt! this is an awesome idea. We are on MAD, and this is a little high for carbs for us. Any idea to cut that down? I think I might use a little less yogurt and mix it with heavy cream…. I have the full fat Fage at home which does have a little less carbs (I think). You could definitely use less chocolate! Half of what I used would be enough. Yes, you can eat the entire thing. At the top of the post, right above the picture, I list the nutrition info and number of servings. MOST recipes on this site are individual servings unless it says otherwise. Hi Dawn. I am 28 and was diagnosed with complex partial catamenial epilepsy in early 2010. I had never had a seizure earlier in life and I came to find out that I had been having simple partial seizures daily for a year before they became severe enough for me to seek help. By the time I saw a neurologist, I was blacking out daily and had significant amnesia. I was originally prescribed Levetiracetam, but not even doubling the dose helped one bit. It took a little over a year to find a plan that worked, but it felt like a lifetime. I truly empathize with your situation and the struggles you faced trying to help your daughter live a normal life. That being said, I came across your blog because I am seeing if a ketogenic diet will help with PCOS, not epilepsy directly. (Luckily, I have been seizure free for almost three years now. My neuroendocrinologist suspects that the PCOS triggered the epilepsy, and I suspect that Yaz triggered the PCOS.) I would love to stop my medications, and so we will see if controlling my diet will keep my hormones balanced. I do not have to be nearly as strict for my purposes, but your blog has been very helpful and I enjoy your recipes. I can’t imagine what it is like to have epilepsy as a child and my heart goes out to both the children and their families. I have not been posting any comments up to now because my situation is a little different, but when I saw this recipe, I thought I would mention an ingredient I’ve found in case you or others have not yet come across it. I have successfully made smooth yogurt with Nature’s Way Liquid Coconut oil; it stays liquid even when cold because it has a higher concentration of MCTs. If you have not seen it before, you can order it on amazon. Happy New Year and keep up all the hard work! I would like to be more involved in support groups, but it is hard to get started when daily life never pauses, even for good intentions. I don’t know how you balance everything, but I think both people you hold dear, and those you’ve never met, benefit from your efforts. What an interesting series of event that have lead you here! Has the diet been helpful for PCOS symptoms? As for the coconut oil, I have seen the Natures Way, I have not tried it yet, but I think it’s a great idea, especially for yogurt. Kids in particular are usually very sensitive to food textures. Thanks for sharing your story and tip! It is hard to say since my entire situation has been atypical and the diagnoses were delivered in tandem. I was actually 10 lbs underweight when I was diagnosed, which is unusual for PCOS. I have slowly gained back the weight and the memories, but prior to the diet, I often felt listless. Carbamazepine stopped the seizures literally over night, but it also caused leukopenia and osteopenia initially and I had been in a persistent postictal stage for over 12 months due the high frequency of seizures I had endured every day. Calcium, vitamin D and stress reduction (thanks to yoga) helped enormously but I still needed extra sleep no matter what my day was like. Since initiating the diet a couple of months ago, I have felt more cognitively alert and physically energetic. My EEG last year was normal, but my androgens were still a little higher than would be expected since Carbamazepine is an enzyme inducer. A blood test in one week will give me the definitive answer; hopefully lower androgens and lower estrogen. It has been an uphill battle but I think nutrition, exercise and any optimism are truly key to taking control of both PCOS and epilepsy. Your children are adorable and I will keep my fingers crossed for Charlotte and all of the children who benefit from your time, creativity and motivation. so,so,so happy you are back!!! My son is going to love this and it is at our ratio witch makes thngs so much easier !!!!! !